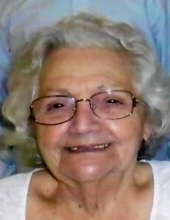 Rose A. Knobloch, (nee Franco), 86, died January 13, 2019 at Brighton Gardens of Edison. Born in Jersey City, she lived in Jersey City and Bayonne before moving to Edison 3 years ago. She was the beloved wife of 66 years of Charles K., the cherished mother of Charles J. of Florida, Rose Donner and her husband Glenn of North Arlington, and Joseph and his wife Joanne of Middletown, the Adored grandmother of Alexander, Benjamin and the late Michael, the dear sister of Josephine Stolz, and the late Mary Lewandowski, Carmela Doyle, Charles, Henry, Timothy,and Frank Franco, and the loving aunt of many nieces and nephews. Relatives and friends are invited to the visitation at the Parow Funeral Home, 185 Ridge Road, North Arlington on Friday, January 18, from 3 to 7 P.M. During the visitation, a religious service will be held at 5 P.M. A private cremation will follow. To send flowers or a remembrance gift to the family of Rose A. Knobloch, please visit our Tribute Store. "Email Address" would like to share the life celebration of Rose A. Knobloch. Click on the "link" to go to share a favorite memory or leave a condolence message for the family.